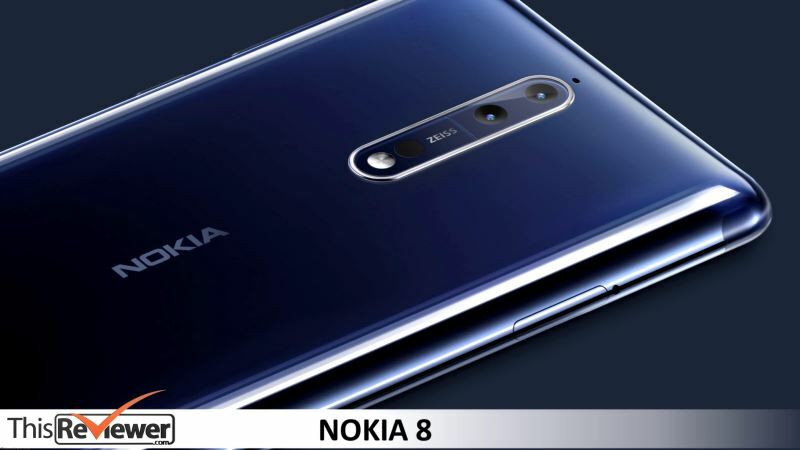 Nokia has been taking a steady road to redemption and has exploded this year with a bunch of budget smartphones that haven’t exactly made world-class impressions, but Nokia 8, which has been the company’s promise of excellence and 2017 flagship has finally hit the market. 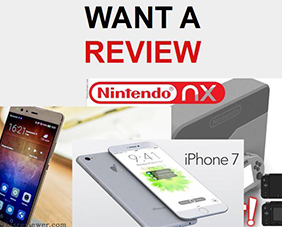 We’ve had some quality time with the device and here are our impressions. The Nokia 8 is arguably the best thing that the company has produced since it was taken over by HMD. The smartphone offers some interesting and very decent feature running on the android operating system. 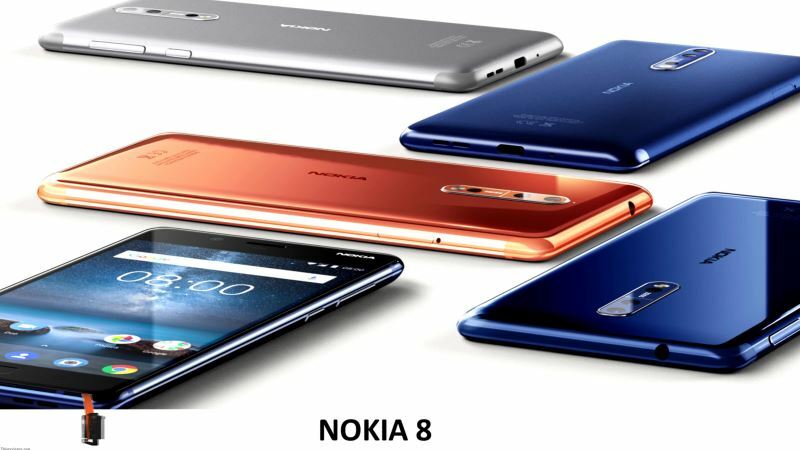 In fact, if you have been longing to have a Nokia flagship device running on the Android platform since the Lumia series, the Nokia 8 is the best you can get as of now. The device launches at £499 which makes it some £500 cheaper than the Apple iPhone X and although the device racks only a 4-star rating in our book, it’s a pretty decent phone to go for if you’re a Nokia lover and want to save a few pennies while still enjoying elegant functionality and performance. Picking up the Nokia 8 device, the first thing that will stare you in the face is its 5.3 inches screen that packs a 2560 by 1440 resolution display. 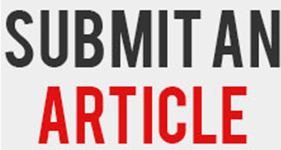 This resolution consequently means that the device comes with a very laudable 554 ppi pixel-perfect density. The screen is protected with a resilient Gorilla Glass 5 screen. 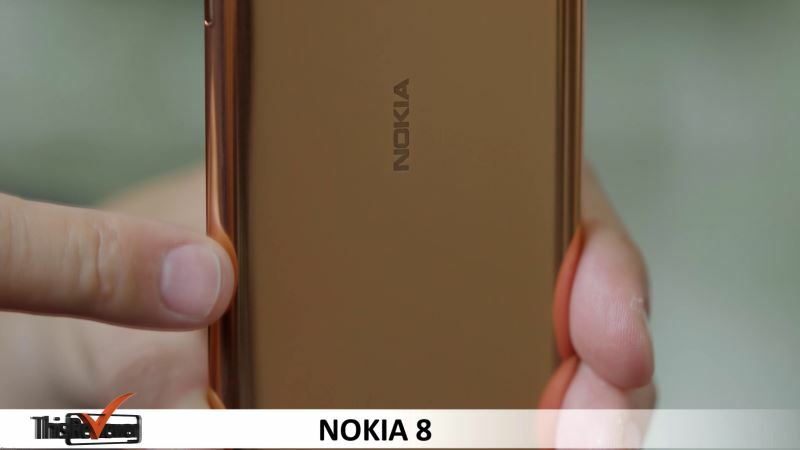 The Nokia 8 does not offer edge-to-edge display capability that is found on the Samsung Galaxy S8 or the LG G6, but comes with what is arguably a super-bright display that gives a dazzling maximum brightness which peaks at 663cd/m2; this means that even if you are out on the sunniest and brightest days, you’ll still never need to squint at your phone screen to catch the display. The Nokia 8 is a pretty decent phone. It is arguably the best that Nokia has offered in a long while. 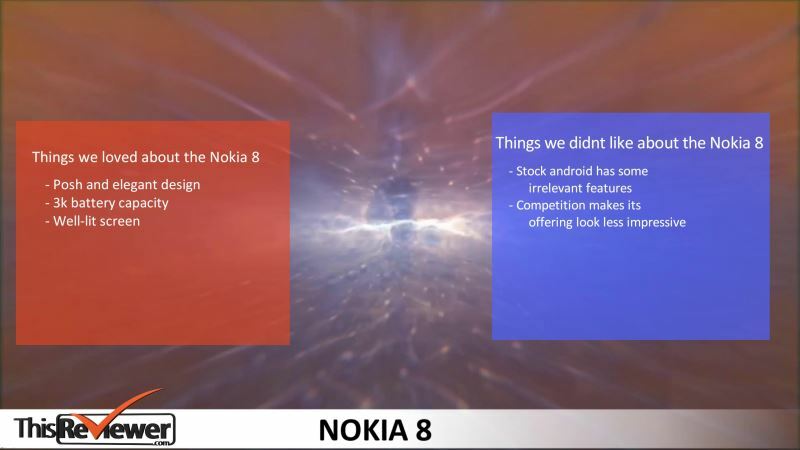 When it’s all said and done however, the available competition is simply what might make the Nokia 8 look like just an above average device. The device faces stiff competition from the Samsung Galaxy S8 that has recently dropped below the £600 price. The Google Pixel also takes off at that range and the iPhone 7 also still available at the starting price of £600. The Nokia 8 is easily the best design sported by any HMD device so far. 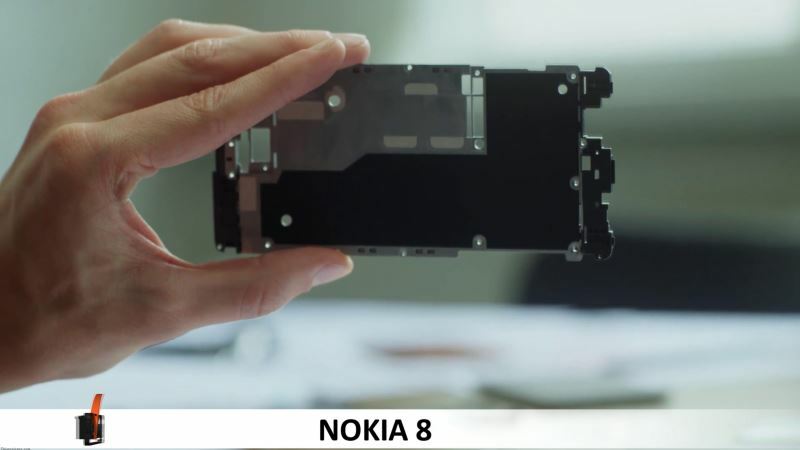 The Nokia 8 charms with nicely chamfered edges, sloping sides and a classic single-block aluminum back. The phone is light and thin spanning just 7.3mm in thickness, and the design is highly functional which means that it’s not all looks and will sit perfectly in your hands and allow you to use the fingerprint scanner quite comfortably. The phone ships in matte and glossy colors but the shiny copper was easily our favorite. 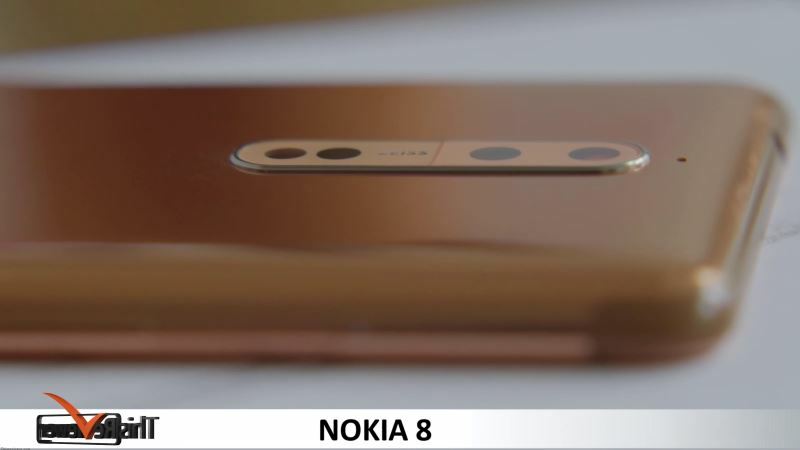 Overall, the Nokia 8 measures 151.5 x 73.7 x 7.9 mm and weighs just 160g. 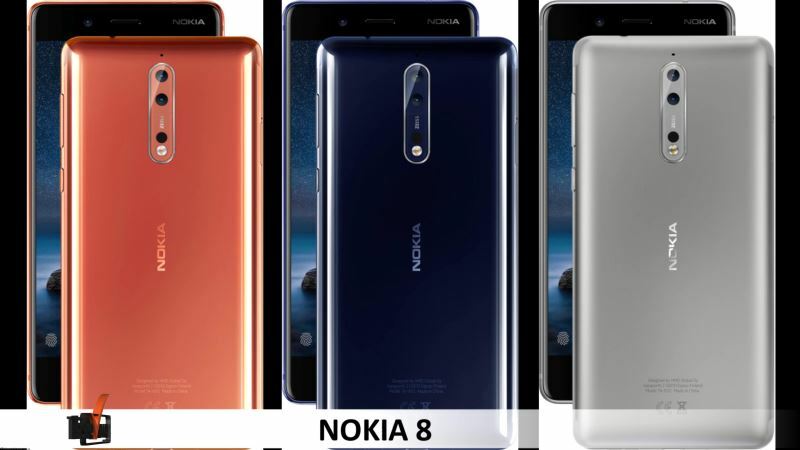 Nokia already released the Nokia 3, Nokia 5 and Nokia 6 and quite honestly, we weren’t impressed by the performance and functionality of these devices. Agreed, most were budget phones, but other brands like Motorola and Samsung also had low budget devices in the same price range or slightly higher that did significantly better than Nokia. That being said, Nokia 8 is a far cry from being slow, sluggish or problematic. 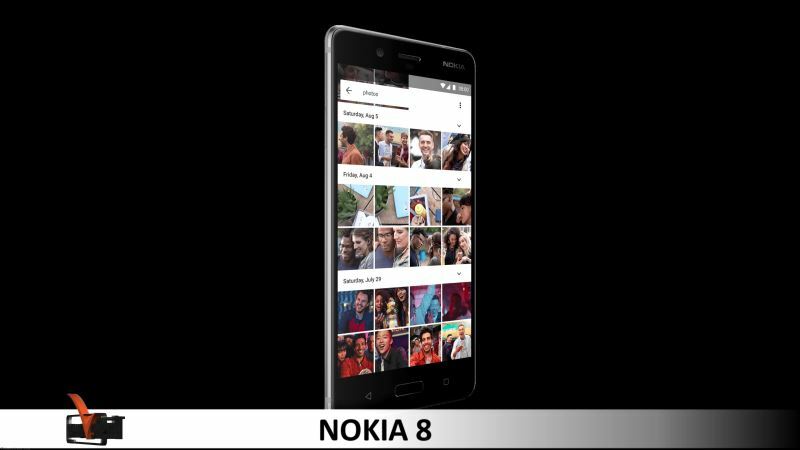 The Nokia 8 is the premium flagship that is packed with 4GB of RAM and the latest Snapdragon 835 CPU. The setup uses a water-cooling element that disperses heat around the phone and ensures a cool, smooth performance. 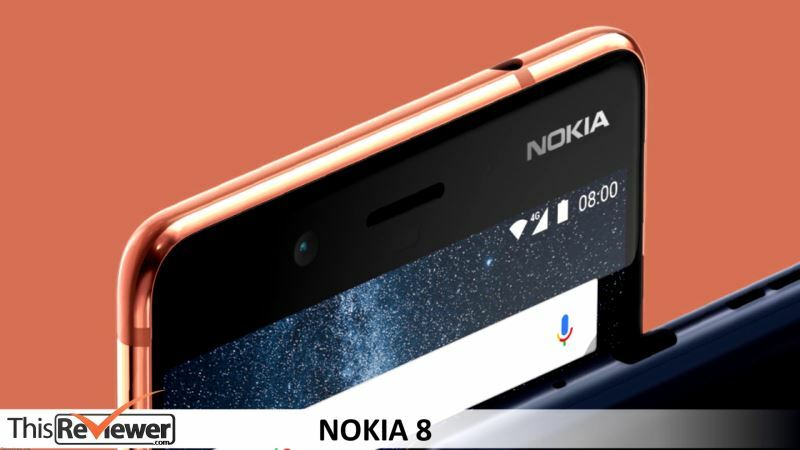 The device runs on the latest Android Nougat 7.1.1 that Nokia has promised to give the Android Oreo update once available. The software also houses a lot of functional and useful apps that will keep users happy and ensure maximum productivity from the device. The camera is one interesting aspect of the Nokia 8. HMD delivers a unique and innovative bunch of features and packs the device with quite the capturing punch with a 13-megapixel front camera as primary and the double 13-megapixel camera lens at the rear. Like most devices in the market today, there is dual LED for the flash. 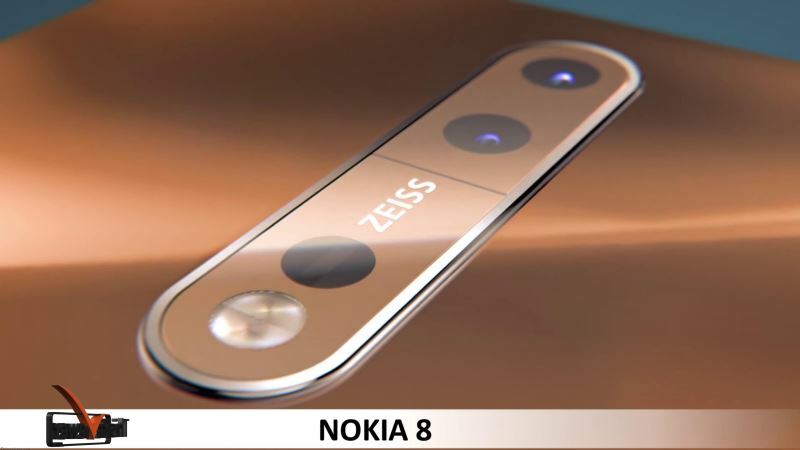 On board the Nokia 8 rear camera, the camera uses Zeiss-branded dual-camera setup. One of the lenses is the monochrome f/2.0 13MP sensor and the other is a 13MP bog-standard RGB sensor with both cameras working together; this allows the phone to take monochrome pictures and enhance low light performance. The phone also has a ‘bothie’ feature that allows users take pictures with both front and rear cameras at the same time. 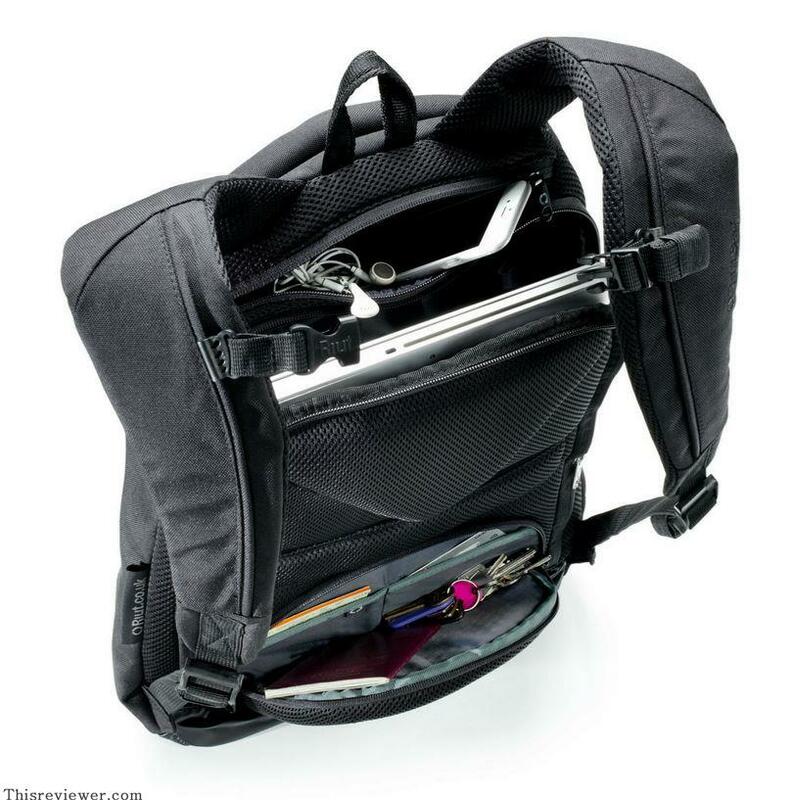 It’s a decent addition that may not thrill the average user but it is definitely one that will attract YouTube and other streaming bloggers. The phone has 64GB onboard storage and supports external SD card use. There is the usual GPS, Compass, accelerometer sensors. 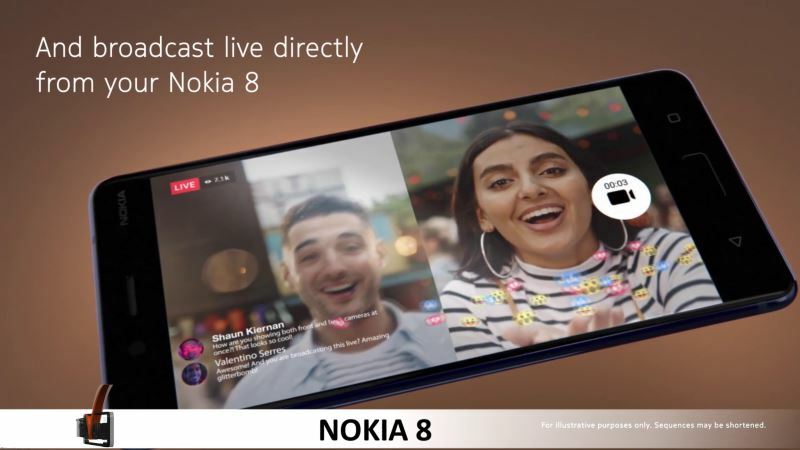 The Nokia 8 has NFC, Bluetooth 5.0 and Wi-Fi capabilities that perform perfectly well to ensure connectivity and file transfer functions. The battery capacity is 3050mAh which is very impressive considering the weight of the device. The phone stood for an impressive 1126 minutes (18hrs 46 mins) on a single charge when used on for a video playback test at a 170cd/m2 brightness. 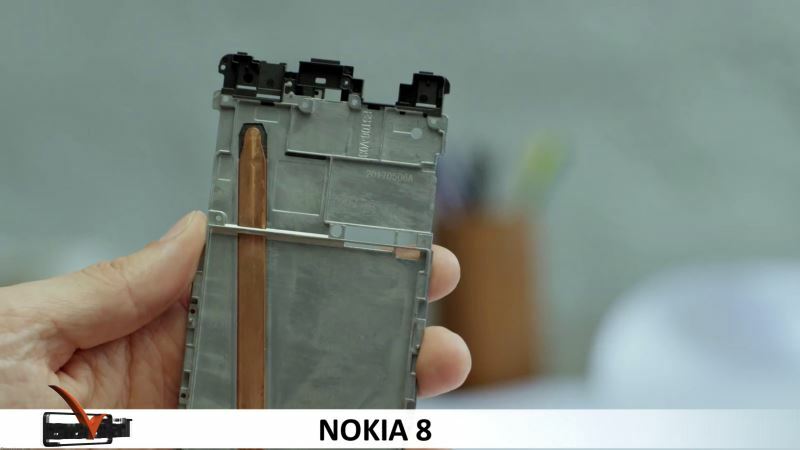 To compare, the Nokia 8 lasted longer than the Galaxy S8, iPhone 7 and Sony XZ Premium. Only the OnePlus 5 beats the Nokia 8 at 1240 minutes.